HVACJobsCenter.com is a Web, Mobile and Social Job Finding and Job Posting Platform dedicated to HVAC Jobs, Refrigeration Jobs and Plumbing Jobs in the US and Canada. The HVAC-R and Plumbing industry is a very large one with excellent employment opportunities in various fields and job categories. Manual work, technical jobs, sales jobs, design and engineering careers, management or marketing… there’s a perfect job for almost anyone in the HVAC, Refrigeration and Plumbing industry. Be the first to apply minutes after the job was posted, impress recruiters and increase your chances of getting your dream job! HVACJobsCenter.com lists exclusive offers along with external offers appearing on other sites. Don’t waste precious hours searching multiple sites for duplicate job offers, find all the best HVAC Jobs, Refrigeration Jobs and Plumbing Jobs in one single place. Find a job now, Register Now! 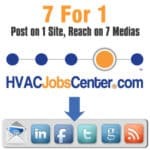 HVACJobsCenter.com is the ideal employment site to post HVAC Job Offers, Refrigeration Job Offers and Plumbing Job Offers. Speed up and optimize your recruitment process by posting your job offers on a specialized website. Create your Employer or Recruiter profile and post your job offers in minutes. Receive applications online, manage your company profile and your job offers in our user-friendly dashboard. Job offers are grouped by job category, job type, salary and tags. Job Seekers can also find jobs using keywords and location (City or State). Note: posting internships and apprenticeships on HVACJobsCenter.com is free. There are two ways to feature your job offer in order to have it noticed by Job Seekers. First, you can feature your job offer in its category – for instance HVAC Engineer – so that it appears highlighted and before other similar job offers. The ultimate option is to Feature it on HVAC Jobs Center’s Homepage. Featuring your Job Offer on Homepage doesn’t only help getting noticed, it also makes it look more professional and serious. Featuring your job post on homepage and category definitely helps attracting higher quality candidates. Recruiters, you can post job offers for multiple employers, either under your name or the employer’s name. When posting new jobs, you can choose to use your default logo and company name or to enter a specific logo and company name for each job offer. Also coming soon, Resume Plans subscriptions allowing you to search and view active job seekers’ resumes. Our plans are competitively priced to keep them affordable for all employers. Yet we have more advanced options available for companies working with decent budgets. We highly recommend featuring your job offers on our Homepage, you’ll get the ultimate visibility at a much lower cost than other options out there. Click Here for more information about available Plans and Pricing. Post in One Place, Reach Job Seekers in Seven Ways! 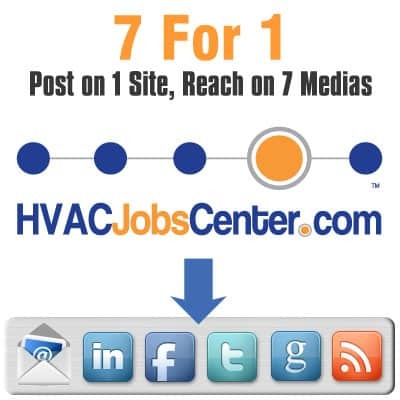 HVAC Connect’s LinkedIn Group, HVAC Jobs Center’s LinkedIn Group, HVAC Jobs Center’s LinkedIn Company Page and HVAC Connect‘s Direct LinkedIn Network of thousands of contacts, only HVAC-R & Plumbing professionals located in the US and Canada. Don’t waste your time and money posting your job offers on multiple generic and passive websites. 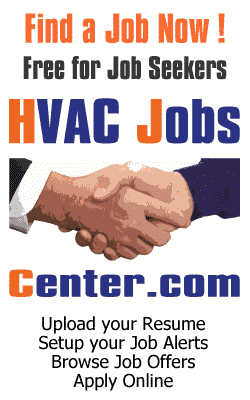 Find the best qualified employees now, post your job openings on HVACJobsCenter.com now!